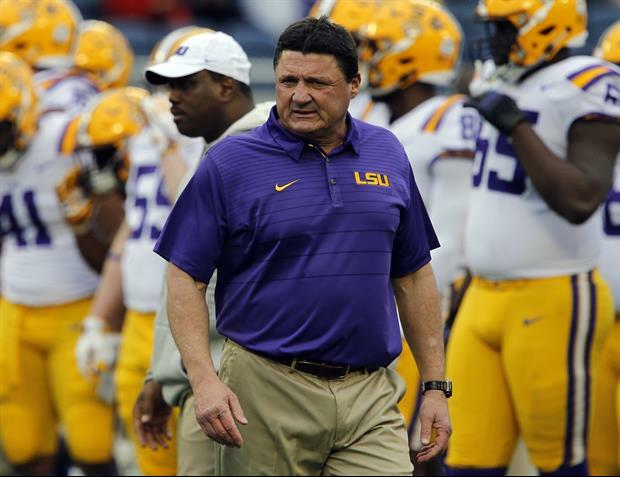 In an attempt to add some depth to the tight end position, head coach Ed Orgeron said Wednesday that some of the "bigger" wide receivers could move to tight end this season. LSU's depth at tight end took a hit this offseason when Jamal Pettigrew suffered an ACL knee injury back in July that will sideline him for the 2018 season. Thaddeus Moss, who sat out last season after transferring from NC State is expected to push for major playing time behind senior Foster Moreau. Behind Moss is Jacory Washington, who did not practice on Wednesday, and five other freshman tight ends. On the other hand, the Tigers are currently pretty deep at wide receiver. Some of LSU biggest receivers include juniors Stephen Sullivan (6-7, 232-pounds), Dee Anderson (6-6, 229), and Drake Davis (6-4, 220). Could you just imagine Stephen Sullivan or Dee Anderson lined up at TE and running routes against a SS or a OLB with Giles, Chase, Marshall, Dillon, Davis, Jefferson all on the outside and in the slot!! My GOD the possibilities are endless. It's the second most important position on the field and nobody gets it. An athletic TE with hands changes the whole defense's mindset, capabilities and packages... Just throw them the damn ball and watch the secondary open up like the grand canyon. Why is there a depth problem? We have a freshmen TE - Zach Sheffer who has a great all around game. Richard Dixon size at 6'3" 235 lbs but is a devastating blocker as well as a good receiver. It'll be interesting to see if he can develop enough to get impactful PT this season. He was an early enrollee so hopefully that helped. We have eight tight ends. Do we need more than 4? Almost 10% of the roster at one position and need depth? Saints did the same thing. May have the next Gronk on the team. Just don't turn out to be a douche like he id.